I´m from Sweden and are a totally beginner in this forum and to farming. On 7 rai outside Ubon Ratchathani i want to design a edible forest garden according to Mr. Robert Harts ideas. So far so god, but now to my problem. All the books i read about this topics is from experience in europe. And i have no idea if this tree, schubs etc is possible to plant in Thailand? I have like millions question but i start only with one in this forum. Is there anyone in this forum who have experiense of forest ore woodland gardening in Thailand? Well, there are quite a few edible plants growing where I live, they should grow where you live..but no guarantees. Jicama is a vining root that grows wild where I live (it is also raised commercially) and is quite tasty. Another plant is the Don Khae, a nitrogen fixing tree with lovely white or purple edible flowers. However I think the best place to start would be older people who know the local edible plants. Good luck with your project. My only advice is check the water availability situation. Not much will grow in the dry season without it. "Once established after about two years, the Forest Garden is self-perpetuating, self-fertilising, self-watering, self-mulching, self-weed-suppressing, self-pollinating, self-healing and highly resistant to pests and diseases. The only work required is pruning, controlling plants that seek to encroach on each other, and mulching with compost once a year, after the herbaceous plants die down in the late autumn". I heard about "Soil doctors" in Thailand and i asked my girlfriend to try contact them. Perheps they could give some god advise. try to make out the Institute/University of Forestry & Agriculture... is all what comes to mind. Princess Sirindhorn and her Father HRH King Bhumipol do support this as well.. Thanks. Yes i agree that dry season can put my project on risk. But they tell me there are groundwater in the area. I think the best way is to start with canopy layer and try to find deep rooted trees. Let them grow a couples of years before expanding with the others layers. Now i only have to find that kind of trees. Any suggestion? Now i only have to find that kind of trees. Any suggestion? According to the picture you posted most of the trees and shrubs in the forest garden are fruit and nut trees (not the usual forest trees), so there are many different species/varieties that you could plant in Ubon. Try to get a copy of "Plant Resources of South East Asia No 2. Edible Fruits and Nuts" produced by the PROSEA foundation. It lists many types of fruits and nuts and provides lots of interesting information and gives the Thai names so you then can ask around (most Thai nurseries won't know the Latin names). I found a copy in the library of Khon Kaen University so you might check the library of the university in Ubon. There are also several legumes that Thai people eat the shoots of like sadao (neem), katin, and ton kee lek, etc. You should definitely include bananas, especially "kluay nam wa" in your forest garden. There is a member of this forum in the north who grows all sorts of fruit plants - search for "blackberry" or "vanilla" in this forum. I think your main problem will be trying to control growth! You will probably have to chop down some trees as they become too large and compete with each other for light. Just checked another book that you should get (Trees commonly cultivated in South East Asia by Michael Jensen) and see that Sadao/Neem/Azadirachta indica is not a legume, sorry about that. I also see in the book that what I thought was a tamarind (with white flesh) is not a tamarind although the Thais call it "makham thet". It's Latin name is Pithecellobium dulce. It is a legume though. My wife is growing another legume that has edible shoots known locally as "cha-om" - sorry I don't know the Latin name. I think a visit to local plant shops will help - I am sure the shop owners can give you suggestions on what to plant. Other trees (not legumes) that you ought to plant include coconut, jackfruit, santol, longan and mango because these fruits are almost foolproof to grow. You might also want to plan on planting some fruit trees for their future timber. If you have to start from scratch, consider first the available amount of water in the soil and the amount of annual rainfall. If the rains do not come you will have to irrigate. Next you will have to create shade. The fastest growing shade trees belong to the genus Macaranga. Very common in disturbed forests. Forest gardening is described in "In the Rain forest" by Catherine Caufield. She describes the Mayan milpa. See also Wikipedia. For Thailand a very good book with each plant described in Thai and in English is Pongpangan, S., and S. Poobrasert. 1972. "Edible and poisonous plants of Thai forests" Sci. Soc. Of Thailand, Bangkok. As far as I know this book is still in print. If you can not find a copy, PM me. Keep us informed about your progress. I found the ideas about multi-layer cropping interesting. This document discusses plants found in SE Asia. Thank you all for answer me and give me useful tips. Now i really feel i´m heading for the right direction. And this books for sure gonna make my life so much esier. Not only can i get more info but if they write the names in thai that will defently help me when i comunicate with Thai people. Now my girlfriend has found one soildoctor from LDD. He will come at the end of august ore september and take soil samples of the land. When we get the result they will help us how to improve the soil in that area. And if i understand everything right this service is free. When i know more i get back to you with a report. In southern Thailand this type of farming is a way of life around the home. Most everything you plant is edible. There is sooo much to take into consideration, soil, weather, water, care, etc. and years of trial and error before you get your perfect garden. Take photos of the fruit trees, and plants you like that are growing in your area and post them here. Someone here or I can tell you what it is. Her are a few suggestions to get started. Ma-muang (mango) "nam duk mai"
Ngoh (Rambutan) "rong rein" is my favorite. Lam Yai (longam) "bieow keow"
Any good book about permaculture would be an essential place to start to provide an overall methodology. Permaculturist Geoff Lawton has a new DVD coming out soon about forest gardens - you can search on YouTube for some previews, especially the visit to the Cambodian forest garden. Some Bill Mollison videos are also available online, especially the Global Gardener series. You need to consider what are your aims - is it to provide food in the short term or to spend a lifetime establishing a food forest. 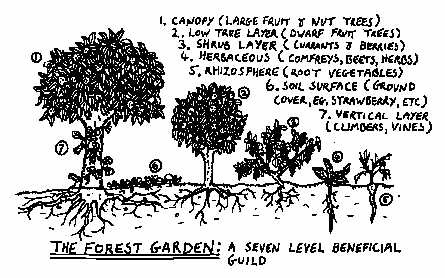 If you are after food, then there are other considerations that override the 7 layer food forest idea. If you are looking for a reliable food supply then it would be worthwhile to research agroforestry. A good place to start is UHDP (Upland Holistic Development Project). Their booklet "AGROFORESTRY OPTIONS FOR SMALL UPLAND FARMS" is a very good starting point (PDF). Remember too that Robert Hart is working in a temperate climate and Thailand is tropical. This means you have different and wider options open to you in terms of the number of species you can grow. Coconut, papaya, banana, bamboo, for instance, are all key plants for a tropical climate. Cultural considerations also play a part as chillies, ginger, basil, rice would be key crops to look at in Thailand. Additionally, many crops that westerners wouldn't eat are common food in Thailand (like Mimosa/Acacia leaves). With so many options available, you can be much more flexible in terms of what you grow. In my opinion an essential crop to grow for its nutritional and water purification benefits is Moringa oleifera "Ma rum". If you want to save effort and set up a no-dig garden on raised beds then you need to plant perennial vegetables/herbs and use lots of mulch. You should avoid compacting the soil and use a much more structured approach. Look at the work of Fukuoka Masanobu (One straw revolution) or Emilia Hazelip's Synergistic Garden for some ideas of what this involves. You should also think of all you other needs - what will you grow for firewood, for forage crops, for construction, for weed barriers, etc. 1/ Is M. oleifera a Thai native plant and what are the "water purification" benefits you mention. I've heard it could be a useful biofuel producer too, but know v. little about this tree. Got some links to more info and any personal experience of planting? 2/ I remember a lot of hype about Fukuoka and his one straw revolution 15 years ago or so, but despite this I never came across anyone in Thailand actually using his methods of no plough and those little clay balls for seed dispersion. A friend in Korea was a bit sceptical about its benefits there too. My question therefore is how many people do you know following Fukuoka's methods and what is their opinion of them? And if it hasn't caught on, is this a problem of extension inadequacy or technology being inappropriate?